Sea Salt can be used in many different ways in the kitchen. 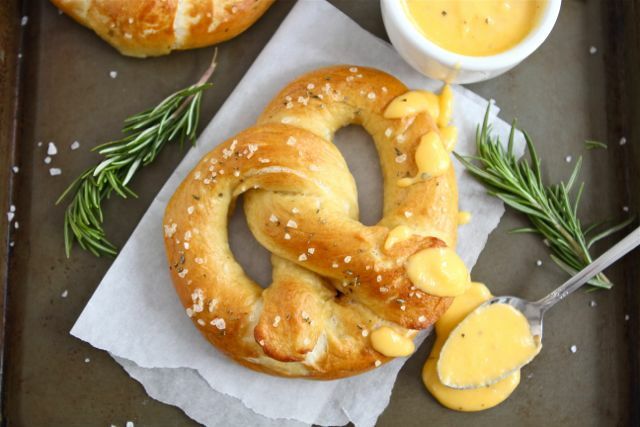 Try this tasty recipe for soft homemade pretzels with fresh rosemary and Pacific Sea Salt. Dip them into a rosemary cheese sauce for a delicious snack! 1. To make the pretzels: combine the water, sugar, yeast, and butter in the bowl of a stand mixer and mix with the dough hook until combined. Let sit for 5 minutes. 2. Add the Fine Sea Salt, flour, and rosemary to the mixture and mix on low speed until combined. Increase the speed to medium and continue kneading until the dough is smooth and begins to pull away from the side of the bowl, about 3 to 4 minutes. If the dough appears too wet, add additional flour, 1 tablespoon at a time. Remove the dough from the bowl, place on a flat surface and knead into a ball with your hands. 3. Coat a large bowl with canola oil, add the dough and turn to coat with the oil. Cover with a clean towel or plastic wrap and place in a warm spot until the dough doubles in size. This will take about 1 hour. 4. Preheat the oven to 425 degrees F. Bring the water to a boil in a large pot. 5. Remove the dough from the bowl and place on a flat surface. Divide the dough into 8 equal pieces. Roll each piece into a long rope. To shape into pretzels, take the right side and cross over to the left. Cross right to left again and flip up. Slowly add the baking soda to the boiling water. Boil the pretzels in the water solution, 2 at a time for 30 seconds, splashing the tops with the warmed water using a spoon. Remove with a large flat slotted spatula or a spider. Place 4 pretzels on each baking sheet, brush the tops with the egg wash and season liberally with Coarse Sea Salt. Bake for 15 to 18 minutes or until pretzels are golden brown. 6. Remove pretzels from oven and let cool on a wire baking rack. 7. To make the Rosemary Cheese Sauce: In a medium saucepan over medium heat, melt butter and whisk in flour. Pour in the milk and whisk until the mixture thickens. Stir in shredded cheese, stir until cheese is melted and smooth. Stir in fresh rosemary and season with salt and pepper, to taste. Serve with pretzels.